SEE: Samuel JACKSON of Dundonald. After reciting said Francis Hamilton in consideration of 1,200 pounds sterling in hand paid by Samuel Jackson did grant and make over to Samuel Jackson, his heirs and assigns, farm of land commonly known as the Moorpark, estimated 101 acres 2 Roods Cunningham Measure with a proportion of moss in Richard Graham’s Bog formerly set apart for said farm situate in the parish of Dundonald and Hollywood County Down to hold to Samuel Jackson, his heirs and assigns … for and during their natural lives of the Cestui que Vies named therein being in the last of any former Rents of the original lease … subject to yearly rent of 12 pounds sterling …. Signed and sealed in presence of Thomas L. Stewart and John Hamilton Jr.
 Samuel JACKSON (1737-1816) , Esq., of Mount Pleasant, Parish of Dundonald & Holywood, Co. Down. SEE: Samuel JACKSON of Dundonald. Mount Pleasant, Co. Down aka Stormount. NOTE: Stormont was first used c.1830 as the name of the house and estate of Rev. John Cleland, replacing the original estate name, Mount Pleasant. It is in the townland of Ballymiscaw, Parish Dundonald. SOURCE: Northern Island Placenames. Moorpark. The context suggests that the land overlaps the parishes of Dundonald and Hollywood. 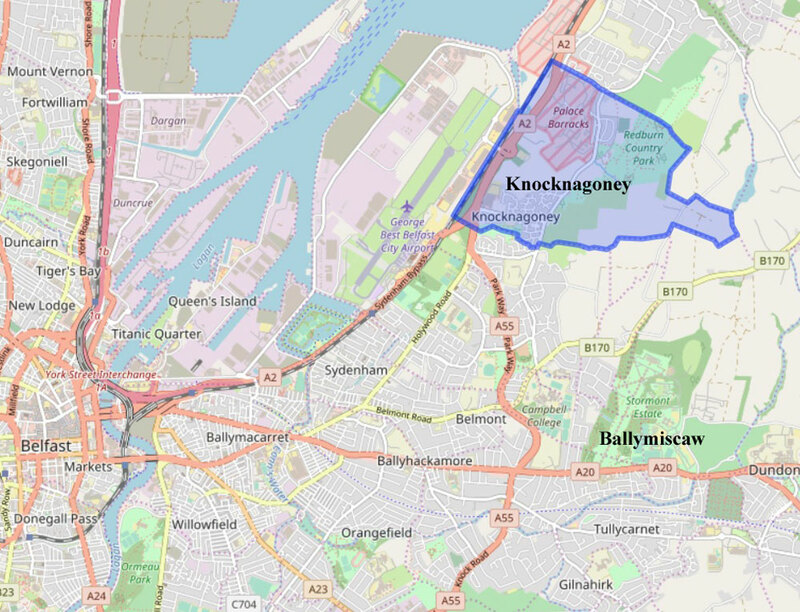 It does not show as a townland, but may have been in Knocknagoney and part of what is now known as Redburn Country Park.